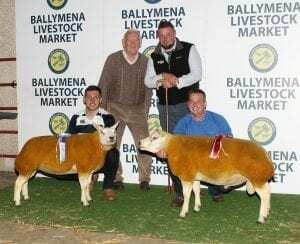 The Brownville Flock’s Supreme Champion, Lot 11, Brownville CJ ET and their Reserve Champion, Lot 38, Brownville Caramel. Showing the winning pair are Mark Latimer, right and David Fullerton, left. Looking on are David Brown and judge, John Harbinson. 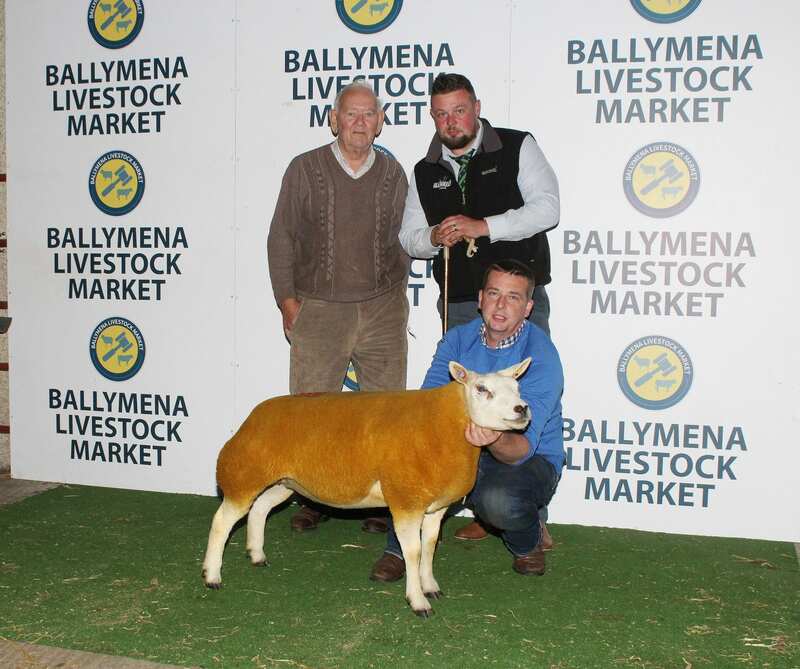 The Female Champion, Lot 38, Brownville Caramel, a Shearling Ewe. Showing the winning ewe is Mark Latimer and David Brown, Brownville Flock, Bessbrook. Also included is judge, John Harbinson. 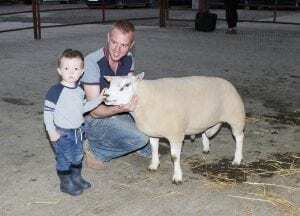 Mark Latimer with the Brownville Flock’s Male Champion, Lot 11, Brownville CJ ET. David Brown, centre and judge, John Harbinson. John Donaghy, Coolough Flock, Loughmacrory, Omagh with his Reserve Male Champion, Lot 19, Coolough Chemical Anchor,a Shearling Ram. Also included is judge, John Harbinson. Alan Burleigh with his Ram Lamb Champion, Lot 26, Derryharney Del Boy ET and judge, John Harbinson. Ram Lamb class in progress. Judging underway in the Shearling Ewe class. 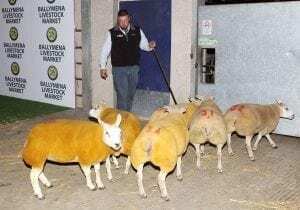 Lining up in the Shearling Ewe class. 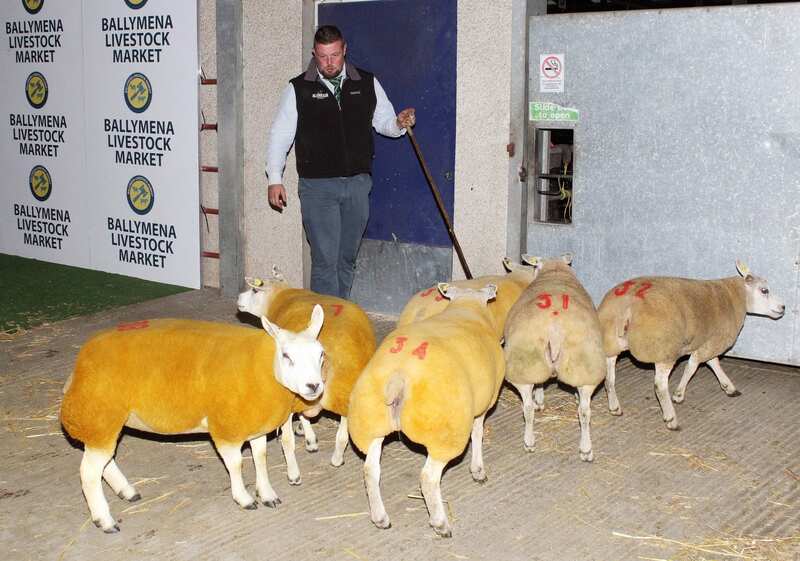 David Fullerton showing Brownville Cinderella ET on behalf of David Brown’s Brownville Flock. 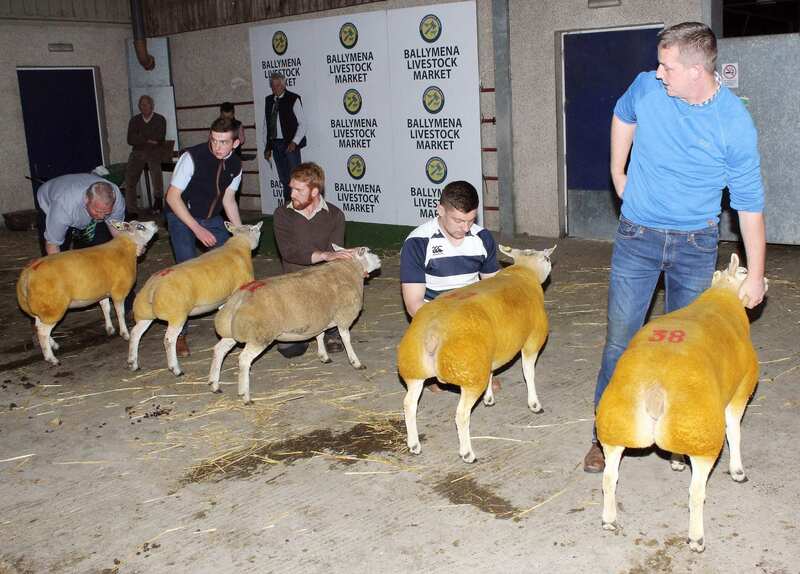 The Shearling Ewe went on to be tapped out as Reserve Female Champion. 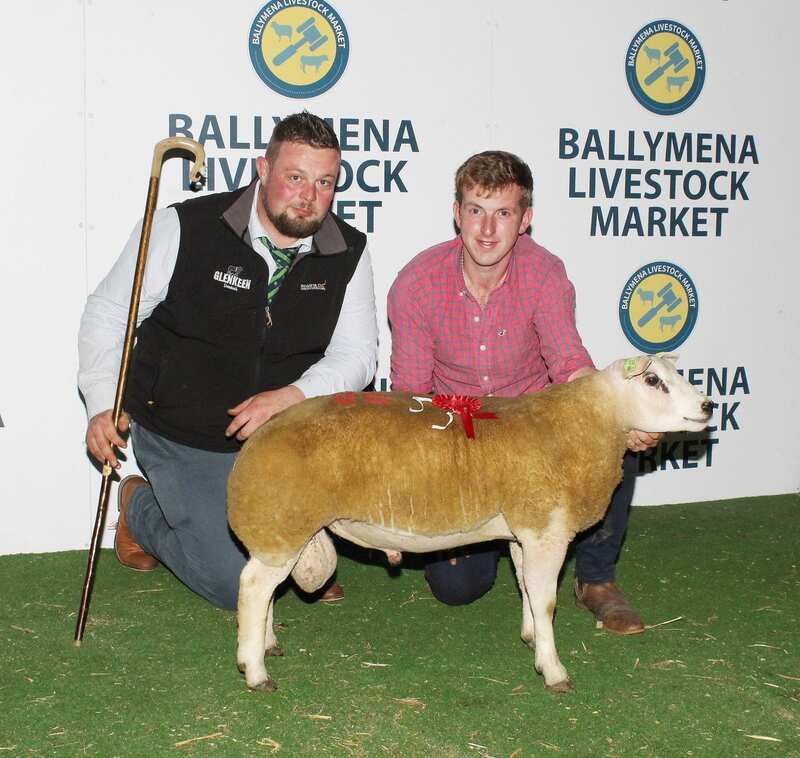 Peter Clarke from Boardmills, Lisburn is assisted in the showing of a Shearling Ram belonging to S P & R Clarke by young Robbie Clarke. It was very much a ‘Champion’ night for David Brown and Mark Latimer’s Brownville Flock at the Irish Beltex Sheep Breeders Club Show and Sale held at Ballymena Livestock Market on Monday, 17th September. The Bessbrook-based Beltex breeders took Supreme Champion honours along with the Reserve Champion title, the Male Champion title and the Female Champion title along as well as Reserve Female Champion status at the evening event. Reigning Supreme was Lot 11, Brownville CJ ET, a Shearling Ram sired by The Bare Boy and out of Brownville Tomboy. 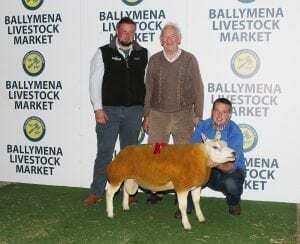 Meanwhile the Reserve Champion title went to Lot 38, Brownville Caramel, a Shearling Ewe, sired by Artnagullion Barbour ET with the Dam, Brownville Take Me Out. 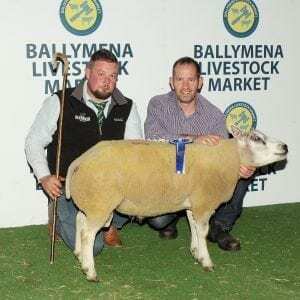 The judge, Beltex Sheep Society Chairman, John Harbinson from Limavady said the Supreme Champion was “a good strong, correct sheep with plenty of body and power whilst the Reserve Champion was “ a great carcass gimmer with super gigots – a good all round sheep”. The Supreme Champion, Brownville CJ ET, was also named Male Champion while Brownville Caramel took the Female Champion title. David Brown’s Brownville Flock also had the Reserve Female Champion, Lot 37, Brownville Cinderella ET. 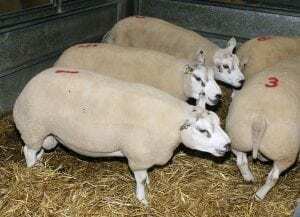 Sired by Artnagullion Willy ET again the Dam was Brownville Tomboy. 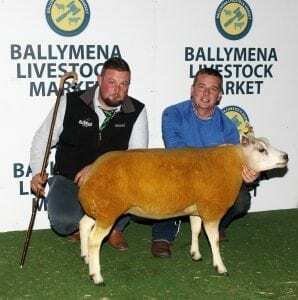 The Reserve Male Champion was Lot 19, Coolough Chemical Anchor, a Shearling Ram belonging to John Donaghy from Loughmacrory, Omagh. 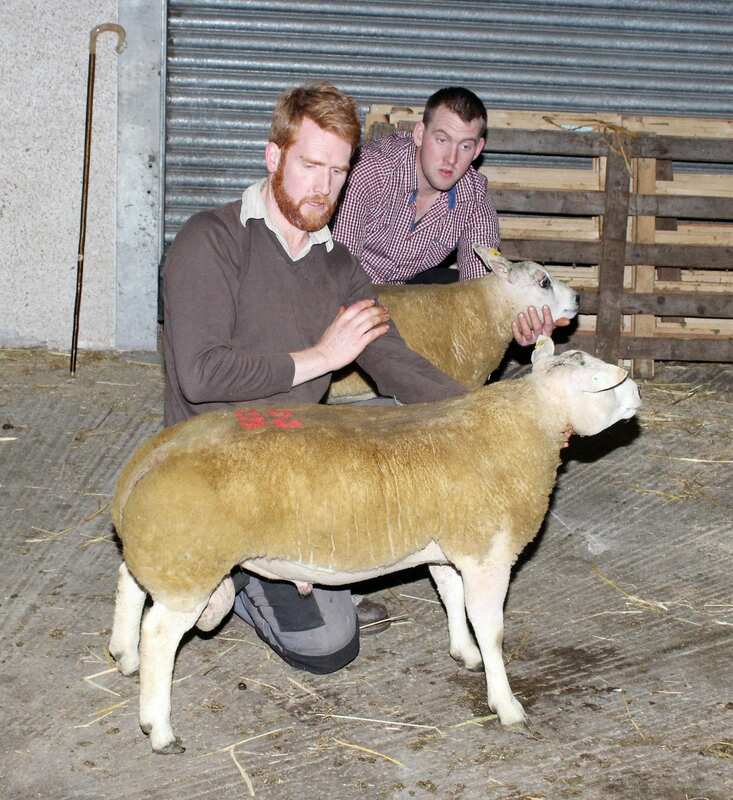 Sired by Coolough Bungle in the Jungle this well-shaped Ram was out of Coolough Tidy ET. 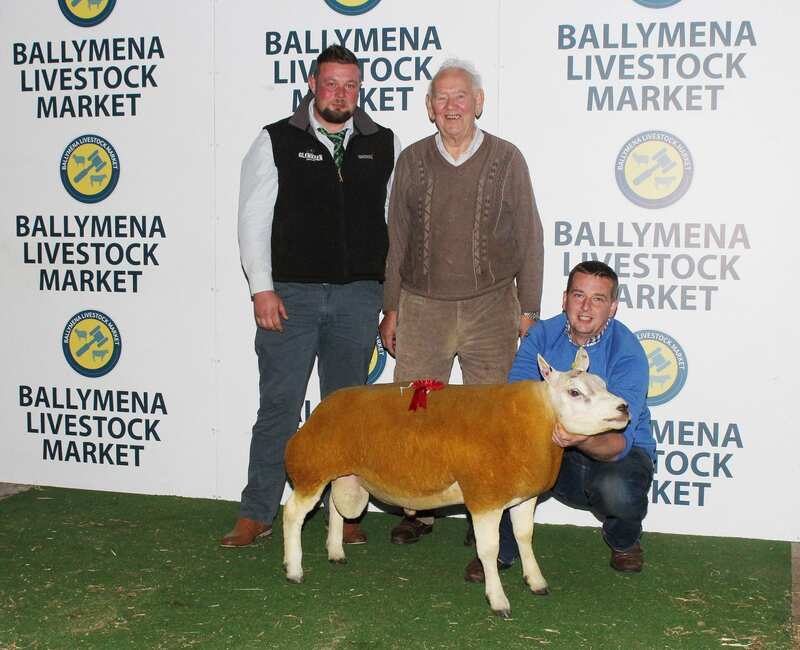 The Ram Lam Champion, Lot 26, was Derryharney Del Boy ET from Lisnaskea-based breeder, Alan Burleigh. 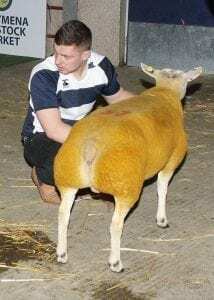 Sired by Jewitt Cracker Jack ET the Dam was Langlands Angela ET. The highest price on the night in the sales ring was 750gns paid for the Supreme Champion, Brownville CJ ET, by show judge, John Harbinson. 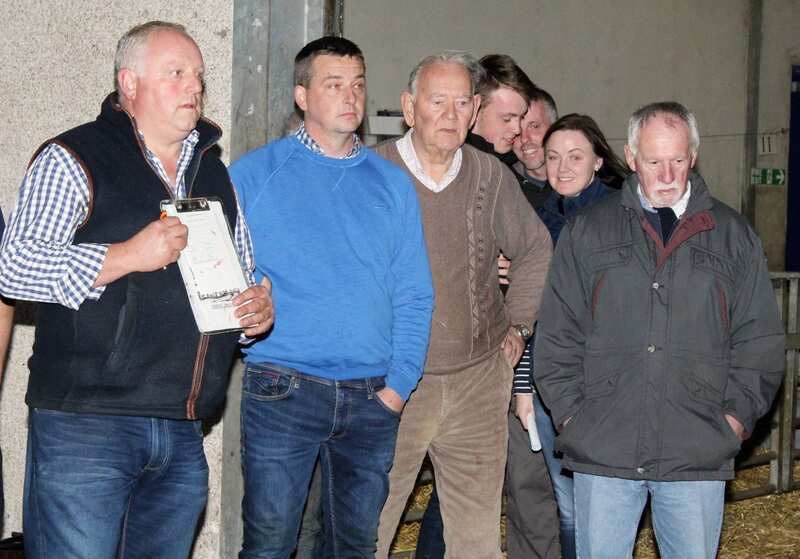 Next highest price was 700gns which was given by M.J. O’Hara for John Donaghy’s Reserve Male Champion, Lot 19, Coolough Chemical Anchor. This was followed by a price of 420gns paid for Lot 12, Brownville Charles, another Shearling Ram belonging to David Brown and Mark Latimer – the purchase was made by James Jardine. Omagh-based Sean Daly achieved the next best price of 350gns for Glenview Common, Lot 14, a Shearling Ram. The buyer was Colin Woodside.